A professional sculptor since 1976, Jay Hall Carpenter earned his reputation during 20 years as sculptor for the Washington National Cathedral. He created the original carver’s models for over 500 sculptures that adorn the gothic, limestone building. These sculptures include saints, angels, grotesques, and gargoyles. Many American churches have commissioned his work, as have the State Department, the Smithsonian, Canterbury Cathedral, and the New England Medical Center. Other clients include, the University of Missouri at St Louis, and the State of Maryland. 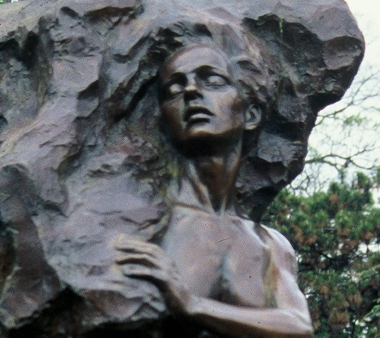 Carpenter was elected into the National Sculpture Society before the age of thirty and has received multiple national awards for his sculptures. Carpenter has also won numerous sculpture design competitions, including those to create an eight-foot bronze of Maryland State Comptroller Louis Goldstein for the State Capitol, and a life-size bronze and granite sculpture of Jim Henson and Kermit the Frog for the University of Maryland, where Henson was a student in the 1950’s. 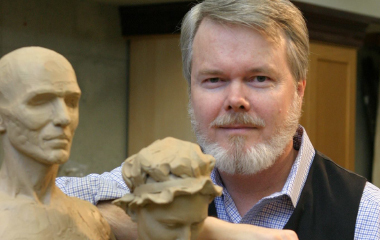 George Lucas selected Carpenter to create the sculptural centerpiece for a new film school at the University of Southern California. This heroic bronze of Douglas Fairbanks, Sr. stands atop a decorative fountain in the entry courtyard. After a national search for sculptors, Saint Anne’s Catholic Community in Barrington, IL commissioned Carpenter to create its twelve-statue program, Community of Saints and Holy People. These powerful, near-life-size interpretations of historic and modern saints adorn a dramatic new worship space. Carpenter’s education includes study at Pratt Institute and The Catholic University of America. He has served as sculptor’s assistant to Master Sculptor Frederick E. Hart, working on Hart’s major projects for the Washington National Cathedral and the Vietnam Veterans Memorial in Washington, DC. Carpenter has also served as Sculptor-in-Residence at the Washington Cathedral, Wesley Theological Seminary, and The Catholic University of America, and has taught at the Art League School in Alexandria, VA, Montgomery College in Rockville, MD, and The Catholic University of America, DC. His sculptures are exhibited in premier fine art galleries in the United States and England. Carpenter’s careful management of his career, balancing classroom study at the Pratt Institute with hands-on training at the Washington Cathedral, has placed him squarely in the tradition of America’s finest public sculptors. I found myself gleefully anticipating those (portrait) sessions. The combination of watching Jay at work and seeing that incomparable view of the Cathedral was like a battery for me. From angels and gargoyles to the massive Greek men and idyllically beautiful, youthful Narcissus, captured perfectly in that serene moment when he becomes mesmerized by his own reflection, on to the modern interpretation of the duality of personality, Carpenter's repertoire of ideas, images, and metaphors seems limitless.